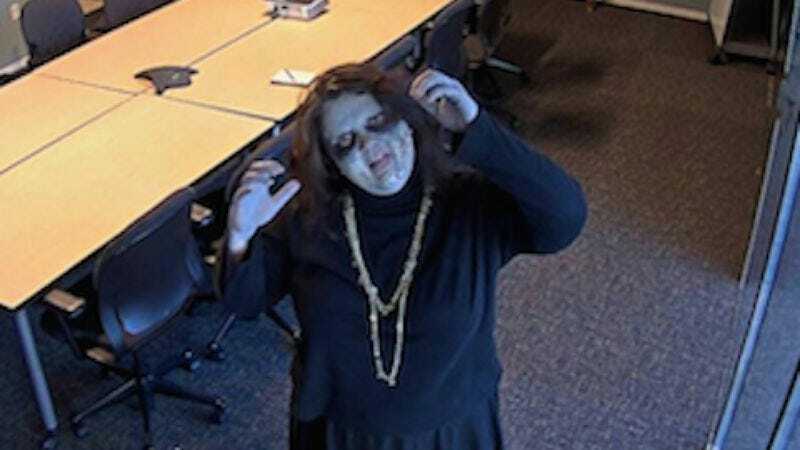 Animal Planet has discovered a intern zombie roaming the hallways of its headquarters, and has captured her in one of its conference rooms. Given that zombies were once human, and humans are technically animals, the network then made the leap to putting up a 24-hour live stream of the woman in a hoodie and black skirt undead abomination on its website, an ingenious solution to Silver Spring, Maryland’s annual Halloween Puppy Parade being canceled this year. The live stream will continue until they have to start paying her overtime the gates of hell have once more been closed. As of this writing, the “zombie” was posing for pictures with employees remarkably unfazed by the presence of a rotting, animated corpse in their midst, and presumably hoping that a cow will give birth or something soon so she can take a bathroom break.